Have you ever opened a cooler full of beer only to see nothing but pry-off tops? Have you attended a birthday party where a gang of unruly 3rd graders insists that batteries be immediately installed in all of the new toys? 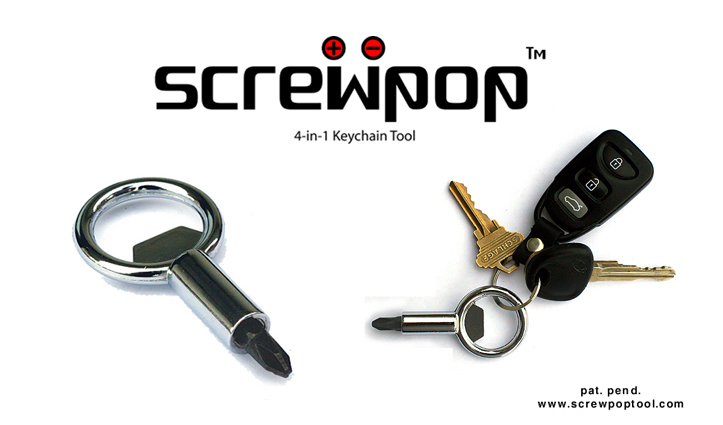 There is no need to fear these situations any longer thanks to Screwpop™. The Screwpop™ is an extremely convenient tool that fits right in the palm of your hand. As a screwdriver, it leverages surprisingly impressive torque delivered through a reversible snap-in Flathead and Phillips screw-bit. Old, weathered, and rusty screws were no match for the tool in our tests. The compact design even functions as a ¼” nut driver for tightening loose bolts and works as a mini pry-bar for working things apart (using flathead bit). The Screwpop™ also functions as a bottle opener for people who’ve worked up a thirst unscrewing things. Noticeably smaller than most car keys, its compact size fits nicely in the pocket without adding significant bulk. I added it to my keyring this weekend and had no trouble adjusting to the extra mass. The Screwpop™ has a high build quality, including some etchings on the tool (absent in the pictures above) that add a nice level of detail. With a paltry price of $4.95, you really can’t afford to not have one of these on your keyring. This entry was posted in Gifts, Home and tagged gadgets, screwpop, Tools. Bookmark the permalink.